In the summer of 1944, the mostly teenage soldiers of the 12th SS Hitlerjugend Panzer Division threw itself against the mighty Allied onslaught to retake Europe. Sixteen hours earlier the first reports of the June 6 Allied landings had been received. Colonel Kurt Meyer had finally received orders committing his regiment to the struggle to throw the Allies back into the Channel. However, since receiving the order, confusion as to the true scale and nature of the landings had hampered the German high command, and a German armored counterstroke was late in forming. But first, Meyer’s 25th Regiment, which was located with the rest of the division to the west of Paris and south of Rouen, had to reach the battlefield. At 5 o’clock on the afternoon of June 6, 1944, the division’s 229 tanks and assault guns, 658 armored vehicles, some 2,000 soft-skinned vehicles and 20,540 men moved off along three routes. “We’ll soon give it to Tommy!” was the banter remembered by Corporal Helmuth Pock as the boys traveled to the front. Despite the overall exuberance, Pock recalled that many of the youngsters were smoking cigarettes to steady their nerves. Driving forward in a Panzerkampfwagen (PzKw.) Mark IV medium tank, Pock soon ran into traffic jams that hampered the division’s advance. While progressing slowly he heard many words of encouragement shouted to the tank crews. When they got closer to the front, some of that excitement was tempered by seeing the number of vehicles shot up by Allied fighter-bombers, the dreaded Jabos. Losses to enemy aircraft were not heavy, but the accumulated delays caused by wrecked vehicles were enough to destroy the division’s timetable. By nightfall, barely a third of the division’s strength had reached the assembly area southwest of Caen. Despite the delays and fear of what lay ahead, morale remained high as soldiers hastily dug in and erected camouflage netting around their positions. As soon as his men reached the assembly area, Meyer went to the headquarters of the 716th Infantry Division to get a better picture of what was happening. He was disturbed to discover that even the division headquarters had lost all communications with its regiments and battalions. “Caen is a sea of flame,” he noted as he negotiated blazing trucks at the roadside to rejoin his regiment. The battle was at a critical stage. Nearly 10 Allied divisions faced seven battered and fragmented German divisions. Unable to concentrate effectively, the Germans would be forced to launch their counterstrokes with whatever forces were available. Nevertheless, Meyer was still confident. “Little fish,” he called the enemy. “We’ll throw them back into the sea in the morning.” Meanwhile, the 3rd British Division had been ordered to close the gap that the 21st Panzer Division had created between itself and the 3rd Canadian Division on June 6. At the same time, the 3rd Canadian Division was directed southwest toward Carpiquet airfield. Army Group B, which was responsible for plugging the rapidly expanding hole in Hitler’s Atlantic Wall, was now reduced to scraping together a Kampfgruppe (battle group) of the 12th SS and part of the 21st Panzer Division. The scratch formation was supposed to drive the Allies back to the beaches. Meyer had three Panzergrenadier battalions in the line with two companies of tanks behind each flank and artillery in support. He was also told that the 21st Panzer Division had been ordered to form up on his right flank. Watching the Canadian advance unfold from the tower of Ardenne Abbey, he could see an opportunity opening in front of him. At 10 a.m. on June 7, the 50 Mark IV tanks of the 2nd Battalion, 12th SS Panzer Regiment, arrived and moved into position. The 1st Battalion, with its powerful PzKw. Mark V Panthers, was stranded and momentarily idled east of the Orne River for want of fuel. The Canadians continued to file across the German front. Once the lead Canadian tanks reached the ridge south of Franqueville, they spotted one of Meyer’s panzer companies waiting to advance. It was at that moment that the German youngsters could hear Meyer’s voice over the radio net, ordering them to advance. Meyer’s panzers roared around Authie and headed for Buron. Canadian anti-tank guns hit four or five of the tanks, and the Hitlerjügend crews’ inexperience showed as they turned away while trying to retire. Hans Fenn’s tank was one of those hit: “The shell tore off the tank commander’s leg—SS Scharführer [Sergeant] Esser—but I heard he got out of the turret later,” Fenn recalled. “Phosphorus shells caused the tank to instantly burst into flames all over. I was helpless….I made my way back with third degree burns, toward our grenadiers following up. They recoiled from me on sight, as if they had seen a ghoul.” The Panzergrenadiers reached Buron but were forced out by a Canadian counterattack. Meyer was concerned at the slowing of the attack’s momentum. The Canadians had recovered from their initial surprise, and now their artillery had found the range and was heavily shelling the area. Nevertheless, Meyer ordered his tanks to resume the attack. Meanwhile, the 1st and 2nd battalions were approaching Cambes. “Until Cambes, everything went well,” Emil Werner remembered. “So far as we were concerned, the village looked fine. But on the outskirts we came under infantry fire and then all hell broke loose.” Two men were killed, but the tankers still had not seen any enemy soldiers. Unaware of exactly what was to his front and unable to make contact with any supporting formations, the battalion commander leading the attack on Cambes decided to go onto the defensive. With his attack now slowing down, Meyer was horrified to discover that the 21st Panzer Division had not yet been able to advance, and his right flank was open and being menaced by Allied tanks. Although their situation was now precarious, the boys of the 12th were reluctant to withdraw. A company commander described the difficulty of extricating exposed sections that, having fought their way forward, would not retire: “All had the will to reach the sea. It was difficult to get them back on the leash again. The order to fall back was met with disbelief, and as a result was followed only after a long delay.” Some witnesses later said that they came across boys from the division crying over their failure to force the Allies back into the sea. That evening, the 26th SS Panzergrenadier Regiment arrived and moved into Putot, but was thrown out after a fierce counterattack by the 7th Canadian Brigade. With neither side able to secure complete victory, the lines on either side were solidifying and turning the battle into one of attrition around the villages. A company of Panther tanks finally appeared on June 8, and Meyer personally led a night attack toward the village of Rots, which they reached at midnight. After several hours of confused fighting, however, the Germans were forced to withdraw, leaving behind six tanks. The Canadians noted that despite advancing with courage and determination, the young Germans seemed to lack tactical control and had a habit of attacking piecemeal, failing to exploit favorable opportunities. With pressure mounting to crush the Allied lodgment, the Germans planned a major offensive for June 10, in which the 12th SS, 21st Panzer and Panzer Lehr divisions were also due to take part. Before the attack could begin, however, the Allies seized the initiative and attacked the left flank of Panzer Lehr. A series of local and largely inconsequential attacks was mounted by both sides. Neither was able to secure a strategic advantage, and the German defensive perimeter around Caen tightened. Casualties on both sides steadily mounted. The 12th’s headquarters, positioned some 27 kilometers southwest of Caen, came under heavy and sustained naval gunfire on June 16, killing the commander, Brig. Gen. Fritz Witt, and several other senior officers. So determined had his attacks been since the invasion that Meyer was given command of the division. The 12th was now deployed in detachments north and west of Caen, and like the rest of the German army, was suffering from shortages of ammunition, fuel and equipment. To the north of Caen, some of its panzers supported unreliable units such as the 16th Luftwaffe Field Division. To the west, a flak battery and 15 tanks, together with the 1st Battalion, 26th SS Panzergrenadier Regiment, held the important Carpiquet airfield. British General Sir Bernard Law Montgomery, commander of the 21st Army Group, now began a series of attacks intended to push the Germans out of Caen once and for all. He hoped that seizure of the city would draw the bulk of the German armor to the eastern side of the Allied beachhead and create the conditions for the breakout by the Americans in the west. The first was Operation Epsom, beginning on June 26 and directed toward Hill 112, south of Carpiquet. Meyer’s boys defended each hedge tenaciously but were steadily pushed back by the weight of Montgomery’s attack, which was mounted by three infantry divisions and two armored brigades, with more than 700 artillery pieces in support. One German, forced to the ground by a rolling artillery barrage, surfaced to find his unit swamped by tanks and “furious Scotsmen hurling grenades.” It was a confusing battle, and few participants retained clear memories of it, but the British line moved slowly southward, regularly subjected to fanatical counterattacks by the boys of the 12th. The Germans were now forced to commit their last reserves to stem the tide, but on June 27, the British advance resumed. The Commonwealth soldiers managed to capture Hill 112 the next day. The Germans clung on for a while but then withdrew, and by the 29th the British had secured the important summit. Although the Allied salient was now five miles deep, nowhere was it more than two miles wide. They had yet to achieve their hoped-for breakthrough, and the narrowness of the salient made it an obvious target for a major German counterstroke. Facing the British by June 29 were elements of no fewer than six panzer divisions, including the 12th SS. Beginning late on the 29th, the Germans tried to regain the initiative, but dogged British resistance halted the attack. The commander of the assault, General Paul Hausser, explained that “the murderous fire from naval guns in the channel and the terrible British artillery destroyed the bulk of our attacking force in the assembly area.” Those tanks that did get forward were easy prey to infantry anti-tank weapons, which could pick them off at short range. Montgomery now resumed the offensive. On July 4, the 3rd Canadian Division launched an attack against Carpiquet. Despite suffering heavy losses from German artillery, elements of two Canadian battalions found themselves fighting some 50 Panzergrenadiers in the village. By nightfall, the Canadians held the northern half of the village and airfield, while the Germans controlled the south. Lack of infantry reinforcements prevented the Germans from launching effective counterattacks, but they had stopped the Canadian advance. The capture of Caen had now become as much a matter of prestige as necessity, and Montgomery decided that desperate measures were necessary. For the next four days, the Hitlerjugend was the cornerstone of the defense of Caen against the British I Corps. Finally, by means of 2,600 tons of bombs dropped from the air, Montgomery managed to isolate the forward defenses of Caen. The bombing destroyed the city and exacerbated the Germans’ already acute supply problems. Meyer, unwilling to retire, continued his bitter defense. On July 8, after all hope of holding the city was lost, Meyer ordered his boys to evacuate their positions. Sheer weight of resources on the Allied side made the outcome inevitable. By July 9, the British had captured the city and inflicted crippling losses on the 12th. The division had been nearly shattered. It had only 65 tanks out of an original 150 and had suffered 60 percent casualties. Using Hill 112 as a vantage point, which they had regained after the British inexplicably withdrew on June 30, the Germans were able to dominate the Odon Valley behind Caen and the ground to the north. With German armor starting to move toward the American sector, the British decided to regain Hill 112 and secure it and the surrounding villages. Operation Jupiter began on July 10. Some elements of the 12th SS still held part of the line between Eterville and the Orne River. Although they held the line for a time, the defenders were eventually overcome by sheer numbers. A young grenadier noted in his diary what it was like to face the British: “From 0630 to 0800, again heavy machine-gun fire. Then Tommy attacks with great masses of infantry and many tanks. We fight as long as possible but we realize we are in a losing position. By the time the survivors try to pull back, we realize we are surrounded.” The following day, the division was pulled out of the line and sent to Potigny, some 30 kilometers north of Falaise, for a rest and refit. The respite did not last long. The next major British drive, Operation Goodwood, began on July 18 on the eastern side of Caen. As soon as the attack began, the 12th SS was recalled to help prevent a breakthrough. A British Second Army Intelligence summary of the day before noted that the “12th SS is the only reserve formation not committed and it is but a shell of its former self.” Divided into two battle groups, Kampfgruppe Krause and Kampfgruppe Waldmüller, with a combined strength of just 50 tanks, it quickly became a key element in the defense of the German position south of Caen. But it was an increasingly desperate position. The relentless and punishing attacks in and around the city were sapping the strength of the defenders, and the Allies’ absolute control of the air was making it impossible to relieve or reinforce them. Goodwood was followed on July 25 by Cobra, which coincided with the breakout of the Americans to the west and the beginning of the end for the Germans in Normandy. Cobra was followed by Operation Bluecoat, the return of the British Second Army to the offensive. Following Bluecoat, the Canadian First Army took up the gauntlet with Operation Totalize on August 8. Once more, the pressure was applied directly to the 12th SS. The attack involved a daring and innovative plan in which narrow columns of armored vehicles drove through the defenses at night without a preliminary artillery barrage, but with heavy bombing from the air to seal the flanks. Once they reached their objectives, the infantry exited their armored personnel carriers and cleared out the defenders. Although the attack began well, Meyer’s determination prevented it from becoming a disaster for the Germans. Meyer later remarked on what he saw while driving forward to reconnoiter immediately after the bombing. “Before me, making their way down the Caen-Falaise road in a disorderly rabble were the panic-stricken troops of the [German] 89th Infantry Division,” he said. “I realized that something had to be done to send them back into the line and fight. I lit a cigar, stood in the middle of the road and in a loud voice asked them if they were going to leave me alone to cope with the enemy. Having a divisional commander address them in this way, they stopped, hesitated, and then returned to their positions.” Having rallied the frightened soldiers from the 89th, he sent armor and anti-tank guns to the positions they had abandoned at Cintheaux before directing his two battle groups to counterattack to the north of the village. Stiffening their resistance against continued pressure, the German anti-tank gunners held up the Canadians after an advance of three miles. Over the next two days, the effects of this action and the continuous grind of counterattacks reduced the German division to little more than a reinforced battle group. The Allies tried to bomb their way through, but the Germans had captured a scout car on August 13 with a copy of the plan for the attack, and Meyer moved his men back in time. Between August 14 and 16, the 500 or so Panzergrenadiers and 15 tanks remaining defended Hill 159 to the northeast of Falaise against the 3rd Canadian Division. Under nearly continuous artillery and air attack, the Germans were forced to withdraw when the 2nd Canadian Division broke through on their western flank. Fighting at Falaise itself was another small detachment of some 60 boys from the 12th SS. They held out for three days, and only four were taken prisoner. The loss of Falaise meant the gap between the British and American arms of a large pincer was only 20 kilometers, and in the pocket the remnants of some 19 German divisions were subjected to incessant and increasingly heavy artillery bombardment. With only one tiny avenue of escape left open to them, the pitiful remnants of the 12th SS were ordered to help hold open the northern side of the salient. The aim was to permit the remains of the Seventh Army to escape. Hitler’s refusal to face reality, however, meant that in the end less than half of those within the pocket succeeded in breaking out. Those who did could thank the defenders of the gap, which was under enormous pressure for two days. When the withdrawal had been completed, Meyer ordered a French peasant to guide his last small group of some 200 men across the Dives River. On August 22, Army Group B reported that the 12th SS Panzer Division consisted of 10 tanks, 300 men and no artillery. It had effectively been destroyed in Normandy. The Hitlerjugend shared many characteristics with other formations of the German army and Waffen SS fighting in Normandy in 1944. They fought exceptionally well and suffered appalling losses. The 12th had been well equipped, but in other respects it was less well provided for. Its training was not as thorough as in regular formations. 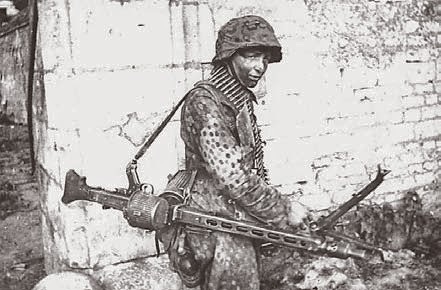 As became the normal procedure for most German formations, especially in the later war years, it ended up divided into widely scattered battle groups where gunners, engineers, cooks and clerks had all found themselves fighting as Panzergrenadiers. However, the primary difference between the 12th SS and other German formations lay in the singular spirit of self-sacrifice these youngsters espoused in the name of Adolf Hitler and National Socialism. Not every one of them was a volunteer, but even the vast majority of those who had been drafted into the division accepted its ethos as a result of their charismatic leaders. Such fanaticism could not always make up for the tactical shortcomings in their senior officers’ leadership. A high level of casualties certainly suggests bravery. But it is not necessarily commensurate with military skill and was no substitute for tactics and firepower. One British tank commander recalled how Hitler Youth soldiers had sprung at Allied tanks “like young wolves, until we were forced to kill them against our will.” The nature of the fighting in Normandy meant that leadership often devolved down to junior noncoms and officers. Hardly older than the boys they led, their fanatical devotion to the point of death was an inspiration to the others. One example was Sergeant Emil Durr, who was posthumously awarded the Knight’s Cross for attacking a Canadian flame-throwing tank. Although seriously wounded, he attacked it three times and eventually destroyed it, losing his life in the process. Unfortunately, devotion to duty, bravery in action and aggression, while in many ways admirable qualities in soldiers, also led to extreme brutality. During the campaign there were numerous instances of the division’s mistreatment of prisoners and civilians. The boy soldiers gained a fearsome reputation for shooting prisoners, especially Canadians, and were responsible for the deaths of 64 British and Canadian prisoners between June 7 and 16. After his capture, Meyer was tried and convicted for the part his division played in the massacre of Canadian prisoners at Buron, Authie and Ardenne Abby. Normandy did not quite mark the end of the Hitlerjugend’s involvement in the war. The 12th SS Panzer Division was re-formed in time to play a part in Hitler’s final gamble in the West. It was to be part of the great Ardennes offensive launched less than six months later in a vain attempt to capture Antwerp, where the division had originally been formed 18 months earlier. Prussian staff officers in the mold of von Moltke-vian military outlook looked at irregular warfare with contempt but not the generation of German officer corps who faced a different kind of threat to Germany at the end of WWI. 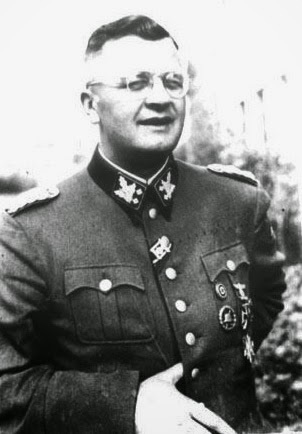 Hans-Adolf Prützmann was the generation of German officers that were involved with the Freikorps and the Streifkorps in the East (especially against Polish irredentism in Silesia). In fact, during the early years of WWII, the Abwehr actually were involved in unconventional/irregular warfare with the Brandenburgers commandos in the Western and Eastern Front. Later in the war, the SS/SD were getting started to be involved in commando operations where officers like Otto Skorzeny, Karl Radl, Walter Girg, Adrian von Foelkersam , Dietrich Witzel, Walter Kraizizek were experts in kleinkrieg (small unit warfare – with Foelkersam as well as other ex-Brandenburgers commandos transferring to SS Jagerbataillon units after the disbandment of the former). It is a lesser known fact that the Germans actually studied the partisan resistance in the East and West against them (Erich von dem Bach-Zelewski studied the Polish Armia Krajowa uprising in Warsaw 1944 and Prützmann studied on the Belarusian communist and Ukrainian nationalist partisan movement) because the Germans realized that the partisan movement (especially in the Eastern Front and Balkans) were severely disrupting them. 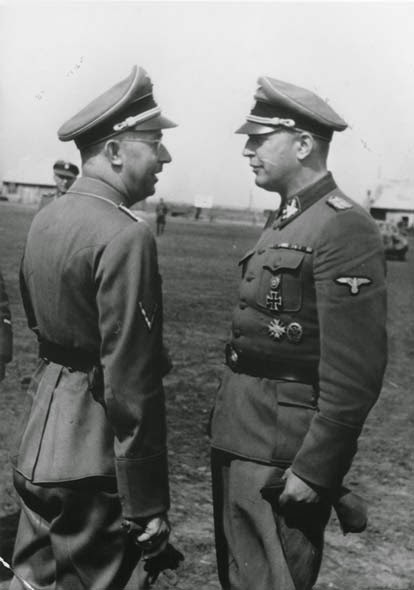 Obergruppenführer Hans-Adolf Prützmann (right) meets with Reichsführer-SS Heinrich Himmler, during Himmler’s visit of the 5th SS Panzer Division Wiking in Ukraine, September 1942. One of his last promotions came in September 1944 when Prützmann was appointed by Heinrich Himmler as Generalinspekteur für Spezialabwehr (General Inspector of Special Defense) and assigned the task of setting up the Werwolf force’s headquarters in Berlin and organizing and instructing the force. Prutzmann had studied the guerrilla tactics used by Russian partisans while stationed in the occupied territories of Ukraine and the idea was to teach these tactics to the members of Operation Werwolf. As originally conceived, the Werwolf units were intended to be legitimate uniformed military formations trained to engage in clandestine operations behind enemy lines in the same manner as Allied Special Forces such as Commandos. In early 1945, under orders from Himmler, he directed the assassination of the Allied-appointed mayor of Aachen, Franz Oppenhoff. In fact, the United States military forces learned much from the experience of the German veterans of the SS Jagdverband in irregular/unconventional warfare (they were the no 3 in Allied search list for Axis personnel after war criminals and technical specialists/scientists) where officers like Karl Radl and WalterGirg (the latter passed away in 2010) who joined the CIA/ Gehlen Organization. Walter Girg known as Walter GIRK (Gehlen Organization alias). 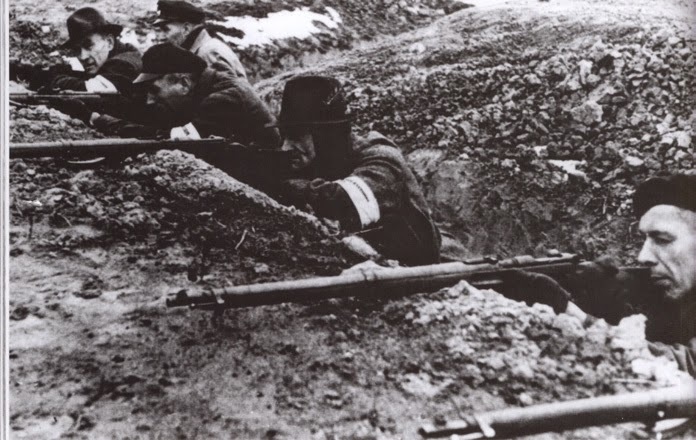 Soldiers of the Volkssturm man a trench system in the late months of the war, armed mainly with World War l-vintage rifles. The price paid by the Volkssturm for their last-ditch defence of the Reich is unclear, but the number of those killed or captured would potentially reach 175,000. The HJ were just some of the unfortunates caught up in the final collapse of the Third Reich. For those who became combatants in the Volkssturm, they stood at the young end of a scale that incorporated thousands of individuals who had no place facing the combined might of the Allied armies. 1st Levy: 1.2 million men in 1,850 battalions (400 in frontier districts); all physically fit 20—60-year-olds without essential war work exemption, assigned to frontline battalions, quartered in barracks, liable for service outside their home district, and including all available NSDAP political officials, Allgemeine-SS, SA, NSKK and NSFK (Nazi Air Corps). 2nd Levy: 2.8 million men in 4,860 battalions (1,050 in frontier districts); all physically fit 20—60-year-olds with essential war work exemption, usually organized in factory battalions, quartered at home, liable for service within their home county. 3rd Levy. 600,000 16—19-year-olds, plus some 15-year-old volunteers, in about 1,040 battalions; mostly 16-year-old Hitler Youths trained in the Wehrertuchtigungslager. 4th Levy. 1.4 million 20—60-year-olds unfit for active service, plus volunteers over 60 in about 2,430 battalions, for guard duty, including guarding concentration camps. The NS-Frauenschaft (Nazi Women’s League) provided rear-echelon support, and on 23 March 1945 were issued with firearms. Not all planned battalions were formed, but at least 700 did see combat, the vast majority of these recruited from the frontier districts in the East, who, along with recruits from the South East, found themselves facing the Soviet forces. Troops recruited from the West were faced with the Western Allies. Reichsleiter Martin Bormann, Nazi Head Office Chief and Hitler’s deputy, commanded the militia on the Fiihrer’s behalf. He was assisted by two chiefs of staff: Oberbefehlsleiter Helmut Friedrichs, responsible for organization and political affairs, and Gottlob Berger, SS Main Office Chief, representing the SS and Replacement Army commander, Heinrich Himmler. A staff of army officers, under Colonel Hans Kissel, was responsible for equipment, weapons and training. Each of Germany’s 42 districts formed a Volkssturmabschnitt (Volkssturm District) under a NSDAP Gauleiter assisted by an SA general or senior NSDAP official. A district contained on average 21 Kreise (counties), each under a NSDAP Kreisleiter assisted by a Kreisstabsfuhrer, and required to raise about 12 battalions. Berger and Friedrichs achieved a good working relationship, but Bormann and Himmler frequently clashed for control of the Volkssturm, a situation exacerbated by a confused chain of command, leaving NSDAP officials and SA officers resentful of the SS’ upper hand. Given the nature of the recruits, the Volkssturm was given an ambitious range of missions: surround and contain large seaborne and airborne landings; eliminate agents and small sabotage groups; guard bridges, streets and key buildings; reinforce depleted army units; plug gaps in the front after enemy breakthroughs, and to man quiet sectors; and crush feared uprisings by the estimated 10 million POWs and foreign workers in Germany. A 649-man 1st Levy Battalion had a 27-man staff; companies 1—3, each with three or four platoons, containing three or four ten-man sections; and a 4th infantry howitzer company. Other levy battalions had 576 men. Each company was supposed to have three five-man Panzernahbekampfungstrupps (Tank Close Combat Squads), each with ten Panzerfauste anti-tank weapons, often manned by HJ volunteers. Each battalion received a consecutive number within its district, e.g. Bataillon 25/97 = 97th Battalion (HQ Konigsberg) in District 25 (East Prussia). During 1945, Volkssturm units helped form army Gneisenau formations within the Replacement Army. In January, 26 ‘Baden’ battalions joined Upper Rhine Infantry Regiments 1—15, later grouped into the 805th and 905th Divisions and 1005th Brigade of the 19th Army — nicknamed the ’19th Volkssturm Army’. The 303rd, 309th, 324th, 325th and 328th and ‘Banvalde’ Divisions contained Volkssturm battalions, as did the Volksgrenadierdivisionen established by Himmler. Other Volkssturm recipients included 16 grenadier regiments and SS-Grenadier Regiment ‘Becker , later part of the Waffen-SS 30.Jatmar Division. Also in 1945, the army formed Festungs units from Volkssturm companies with army staffs, with the unforgiving job of manning defensive lines in the East. Volkssturm recruits, many already working a 72-hour war-emergency working week, were given a 48-hour training programme by armed forces instructors, and were expected to master the rifle, Panzerfaust, the grenade-launcher, hand grenade and Panzerschreck, and in emergency the pistol, SMG and land mine. In fact there were scarcely enough weapons for the 1st and 2nd Levies, and many militiamen were sent into battle unarmed. The 3rd Levy was not issued weapons, and the 4th Levy were expected to use hunting-rifles or captured firearms. Troops were often only issued a trench-spade for self-defence. The Gauleiters on the eastern border began to establish a series of defensive lines during the pause in the fighting after July 1944. Thousands of local men and women, Hitler Youth, RAD conscripts, POWS and foreign forced labourers built tank-traps, artillery and anti-tank positions, protected by earthworks and linked by trenches. Eight lines skirted the East Prussian frontier, three in Wartheland and two in Upper Silesia. Other lines faced the Czech border. By December 1944, these lines were manned by armed forces and Volkssturm units, many organized from January 1945 into fortress battalions. In combat, the Volkssturm paid heavily for its role as last-ditch infantry. Driven from East Prussia by the Soviet offensives of autumn 1944, they became escorts to the three million refugees heading westwards along congested snow-swept roads, harassed by Polish guerrillas. About 750,000 people died from exposure, were killed by overtaking Soviet or Polish forces, drowned on evacuation ships in the Baltic sunk by Soviet air or submarine attacks, or caught in the Dresden air raid of 13/14 February 1945. Some Volkssturm soldiers, aware of the Soviet writer Ilya Ehrenburg’s encouragement to Red Army troops to butcher all Germans, still stood their ground to buy time for the escape of the refugees. Others, afraid of being shot as guerrillas if captured, joined the mass retreat. The Volkssturm’s final, epic defence was in the German capital itself. The last Soviet offensive began on 16 April 1945.The Oder Line was breached, and by the 25th Berlin defenders included 24,000 Volkssturm (18,000 of whom were ‘Clausewitz Levy’ troops of the 2nd Levy, on six hours’ standby). The fighting was desperate. Those Volkssturm who could find the courage – bolstered by the threat of SS police squads hanging them for cowardice — would assault Soviet tanks at close range with Panzerfauste, utilizing their knowledge of the city’s layout. If they secured a good hit, they might knock out the tank, but the blistering Soviet response frequently resulted in their deaths. Nevertheless, many individual Volkssturm rose to the occasion, and defended their city with a passion. 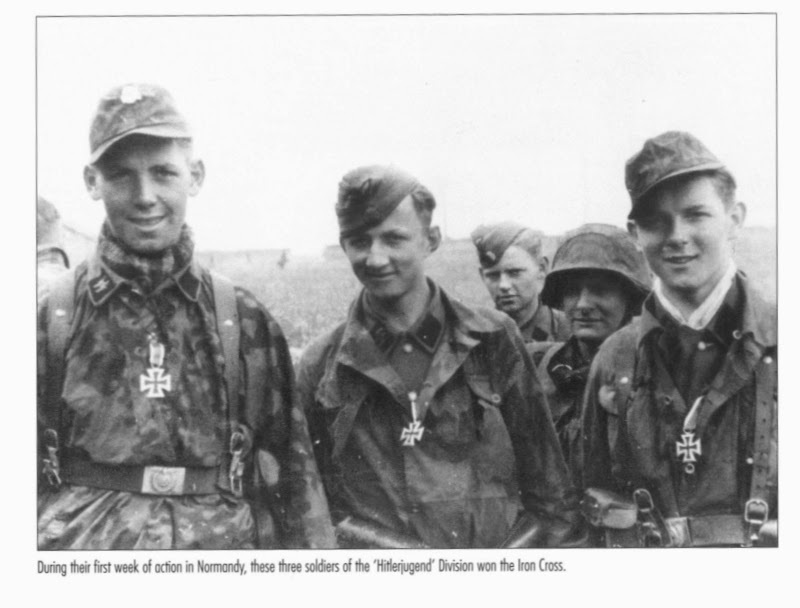 In the battle for Berlin, and that of Breslau (with 45,000 defenders including 25,000 Volkssturm in 38 battalions) Battalion 21/41 and two Hitler Youth 3rd Levy battalions distinguished themselves in the fighting. On 8 February 1945, the Western Allies, in three army groups, began their advance into western Germany. On the 12th the local Volkssturm was mobilized and sent to man the Westwall, but they showed none of the desperate determination of their comrades in the East. Many ignored the call-up; others surrendered at the first opportunity, or threw away their armbands and hid in the woods or returned home. The Westwall was quickly breached and on 7 May the Western Allies met Soviet forces in central Germany. Hitler deceived himself into believing that a huge civilian army, led by militarily inexperienced Nazi officials, could stave off Germany’s defeat. The Volkssturm’s ultimate failure, however, should not blind us to the bravery of many of its members who, though unfit, untrained and underequipped, fought not to preserve their state, but to save fellow Germans from a Red Army eager to exact vengeance for the brutal German occupation of the Soviet Union. 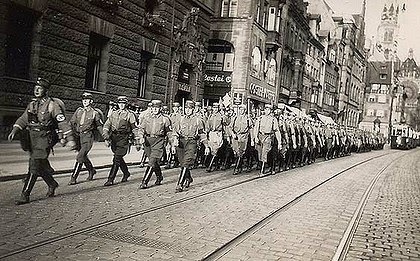 The dictator’s paramilitary machine … the Strum Abtellung (brown shirts) return from manoeuvres on a Sunday in Nuremberg. JOHN RISCHBIETH, then a pupil at St Peters College, Adelaide, was awestruck when, as a 17-year-old in Germany in 1935, he became surrounded by beaming members of the Hitler Jugend (Hitler Youth) and the Bund Deutscher Madchen (League of German Girls), showing him around the brave new Germany Adolf Hitler was creating. He saw the brown shirts – the Sturm Abteilung- marching the streets with their spades, picks and rifles. He saw the SS officers with their daggers and revolvers, and he saw the banners, the flags, the Nazi insignia. He felt a sick feeling develop within him. Mr Rischbieth, 93, was one of the boys who took photos during the visit, many of which he kept for decades until last year when, honoured for his service in World War II with the Royal Australian Navy, he saw fit to unearth them. Some are in a new book, The 39ers – stories of part-time military who enlisted before World War II and went on to serve in the war, initiated by the Reserve Forces Day Council and being launched today at Victoria Barracks. Although taken by innocent schoolboys, they capture the fervour and the militarism sweeping the country two years after Hitler came to power. Mr Rischbieth, whose father migrated to Australia from Germany in 1835, was with a group of 15 Australian schoolboys taken on a tour of North America, Britain and Europe. They included six from St Peters College. Mr Rischbieth shook hands with George V, attended a world Rover Scout moot in Sweden, then did a two-week tour of Germany escorted by two blond, blue-eyed ambassadors for German youth, Herbert Roloff and Toni Reinhart. The boys were accommodated at castles, hostels and camps. In Berlin, they were welcomed by the mayor. ”Of course, they insisted the Germans were peaceful and had no intention of upsetting the world and all that nonsense,” Mr Rischbieth said. The boys were shown the stadium being prepared for the next year’s Olympics and might have met Hitler himself except the fuhrer was running late and the boys had to catch a train. But the boys were less than impressed by what they saw. Italy had invaded Abyssinia and they could see the Germans had the same belligerence. ”When we got onto the ship for Australia, we started to compare notes,” Mr Rischbieth said. Mr Rischbieth was mobilised when war broke out, serving initially on an armed merchant cruiser, the HMS Moreton Bay. In 1941, having been commissioned, he joined a light cruiser, HMAS Hobart, and served with it in the Mediterranean, Singapore and the Dutch East Indies. In the Battle of the Coral Sea, as assistant air defence officer, he was posted on the bridge to watch enemy aircraft and call out ”bombs away!” when they released their load, prompting extreme evasive action. The Hobart was not hit by bombs but was strafed. When the Japanese surrendered in 1945, Mr Rischbieth was on a ship coming into Rabaul and, concerned that the Japanese might lob a grenade, he went ashore to speak to an Australian officer. The officer, John DeRavin, had been one of the boys on the trip to Germany 10 years before. Mr Rischbieth, who returned after the war to work at a shipping company, George Wills and Co, and ended as managing director, will attend today’s launch. He is the last survivor of the St Peters boys who went on the German trip. Three were killed in action. The 12th SS Panzer Division Hitlerjugend went into battle for the first time in Normandy, but gave a good account of itself as the scourge of Canadian arms throughout the Normandy campaign. Derisively called a baby division with a milk-bottle badge by a disparaging Allied press, the division had been formed in June 1943 almost entirely of youths around seventeen years of age. This was a consequence of Reichsjugendführer Arthur Axmann’s Hitler Youth project, approved by Hitler after Stalingrad, to induct senior Hitlerjugend with some military training into a volunteer division. On passing the test of war, this formation would serve as a model for the incorporation of additional volunteers into other German divisions. In June 1943, Oberführer Fritz Witt of the Leibstandarte assumed command, and with other veteran officers and noncommissioned officers from the Waffen SS and army, he instituted a vigorous training program that stressed fitness. One suspects that easier access to better training areas than the Allies had in Britain also enabled them to conduct more realistic field exercises, including live fire. The training philosophy of the Hitlerjugend appears to have been innovative, with great importance attached to inculcating a sense of responsibility, self-sacrifice, and comradeship. Only eighteen-year-olds were allowed cigarettes; younger soldiers were issued candy. The relationship between battle-hardened veterans and inexperienced youth has been likened to that between older and younger brothers. For nine months, despite certain equipment shortages, the 12th SS conducted thorough battle-oriented training. 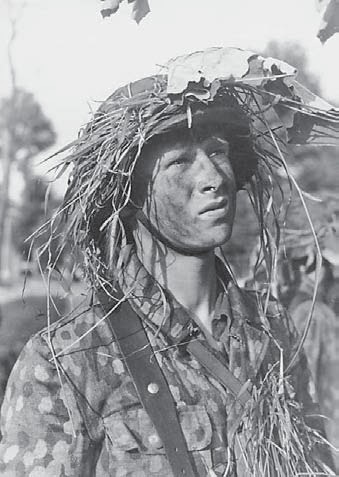 Fieldcraft—in particular camouflage techniques learned from the Russians—received special attention. Marksmanship training focused on shooting not on formal gallery ranges, but exclusively in the field using silhouette targets. Physical fitness was attained mainly through playing sports and running obstacle courses rather than route marching. Parade square drill took a back seat to training under as realistic combat conditions as possible. Panzer battalions concentrated on their basic skills, which included repair and maintenance, driver training, radio operation, and gunnery. As cross-training was an unaffordable luxury by 1944, new crewmen learned only one of these jobs. Formation training from early 1944 consisted of live-fire and large-scale tank exercises that stressed the cooperation of arms within the panzer battle group. By April 1944, the division had already suffered fifteen dead, presumably the result of training accidents. 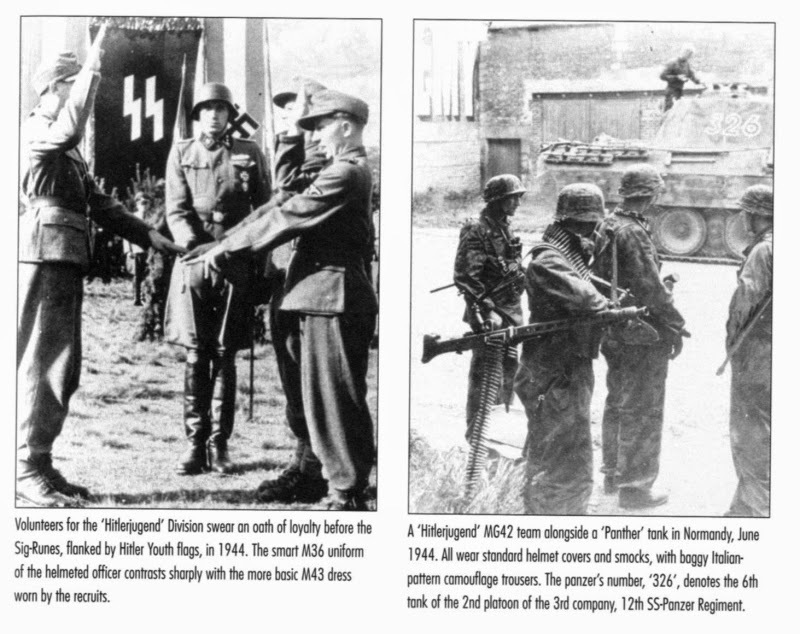 When the 20,540 soldiers of the 12th SS Panzer Division (two panzergrenadier regiments of three infantry battalions each and one panzer regiment with Mark IVs and one Panther battalion) went into action, they were considered excellently trained—as well trained as scarcely any other division had ever been—so that their operational employment could be fully justified. This, more than just will and fanaticism, was surely their great forte.